I'll admit it, I look at some fashion websites. It's a good source of inspiration for me, even if 99% of what's shown is a perpetual theme and variation on one thing -- Black. I'm just NOT that person. And don't get me going on sleeveless jackets for men! I've been drawn to the work of Junya Watanabe for the past few seasons, especially his offerings for spring / summer. I didn't realize that he collaborated with Brooks Brothers a couple of years ago, which on some subliminal level may explain my attraction to his clothes. There's a definite "prep" vibe, but in a very light handed, whimsical way. I do like traditional style, and it's "age appropriate" for me; but I don't want to look like an old fuddy duddy either. I love all these little details. Pockets, piping, patchwork. So my goal is to create my own version. I'm also interested in the look of Engineered Garments. In particular the "fishing vest" look worn over a jacket. I love this short over long look. I'm not sure I can pull it off, but I'm gonna try! 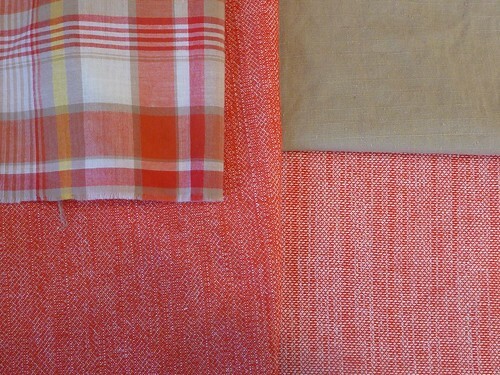 Here are the fabrics I've chosen. A heavy red "Oxford cloth" suiting that's been in my stash for a couple of years now. I bought this sight unseen from Denver Fabrics for something like $3 / yard. It's got an interesting weave, so the front and back are entirely different. I'll be using both the light and dark sides for the body of the jacket. Even though I've washed and dried this fabric twice, it's still quite stiff. It makes me wonder what it was really intended for. Upholstery maybe? Hopefully it won't be the downfall of the whole project. 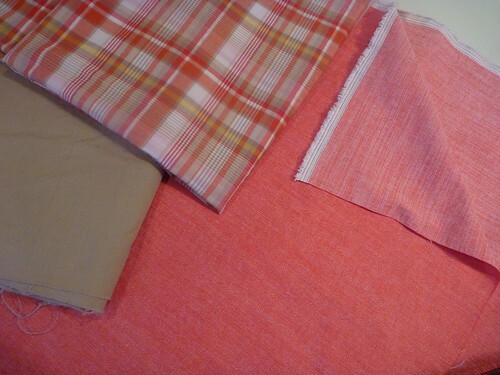 The other fabrics are a madras plaid and a khaki cotton with a subtle grid texture. This photo shows the textures a little better. 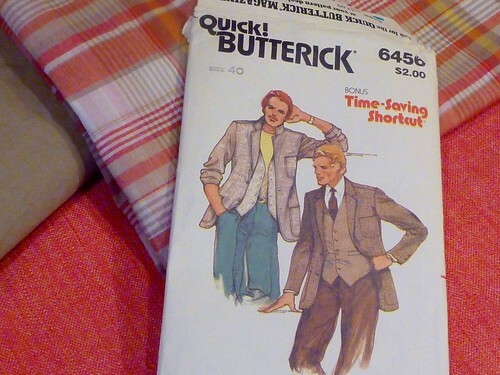 I'm going to be using this Butterick pattern for an unlined blazer. As you may recall this pattern didn't make the cut for the "Phoney Missoni" jackets. Still, I'm intrigued by the yoke and the unfitted boxy style. The goal is an unstructured jacket that I can throw on over a polo shirt or a t-shirt. The spring barn jacket alternative? Perhaps. I won't go into all the gory details, but I fought with the muslin for what seemed like days. Maybe picking this pattern wasn't such a good idea after all. The "intriguing yoke" rapidly lost all its appeal! In the end I felt that I was really grasping at straws to get the damn thing to look halfway presentable. There's definitely a point of diminishing returns with fitting, and I'd reached it. To preserve my sanity I decided to move on, cut it out and hope for the best. The ease was removed the the sleeve cap. The apex of the sleeve cap was moved forward. The armscye was enlarged (it was uncomfortably high at the underarm). Excess fabric was removed from the upper back. The side and back seams were taken in slightly. Will any of this work? Here's hoping. Oh my, this is more more gripping than any TV drama, with a cliff hanger at the end even! I love the sense of adventure - now we are all hoping and praying that forging on into the actual fabric will work out. Your fabric combinations are great. You really have an eye for colour and texture. This pattern is really interesting from the front it looks like a traditional vented jacket. Looking forward to seeing how this progresses. And did you notice on the pattern envelope the teaser: time saving shortcut? A little joke perhaps. Isn't that a killer! I haven't found the shortcut yet!!!!! Looking forward to your project. I love the style inspirations! Great fabric combinations and hopefully the "Oxford Cloth" will behave. Can't wait! You are so edgy and adventurous! Huh... fitting troubles. Don't let them bring you down! 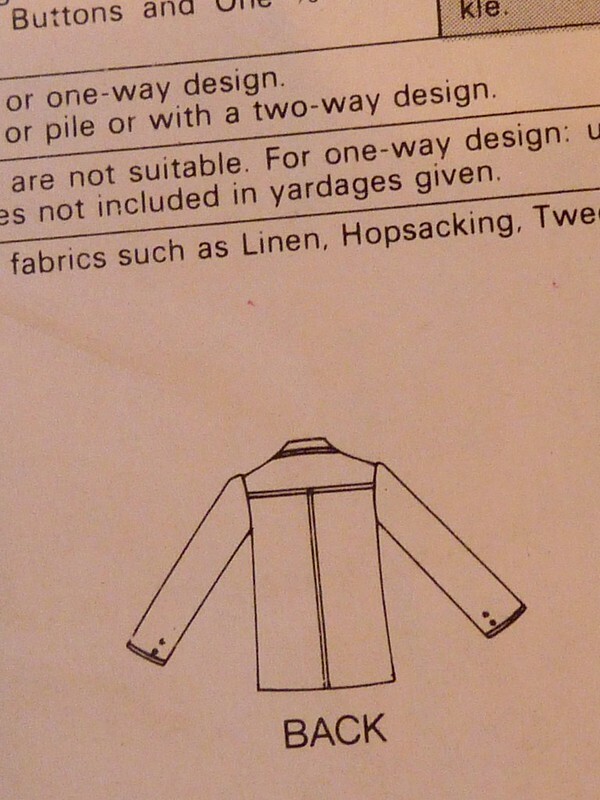 Your plans for this jacket are quite adventurous, I'm very curious to see how they'll turn out. And about that Oxford cloth: If this fabric is (partly) cotton or linen, and it looks like that, you can also try washing it with a double dose of fabric softener. I've had good results with that in the past (usually when using very stiff denim for designs which needed a bit of drape). I've been following your blog for a few months and have found it quite interesting and you are a fine sewist. Peggy Sagers of Silhouette Patterns has a few designs for men but what I want to share is her tip for softening stiff denim and linen without ruining the hand of the fabric is to wash the fabric in your machine with warm water with a bottle of original Coca Cola. Repeat if necessary. I too love the vest over coat look, which was popular for a time in the 1970's women's wear. I never got around to made that look but may still do it. This is kind of hysterical. Coke? Who knew!??? Thanks for the tip.